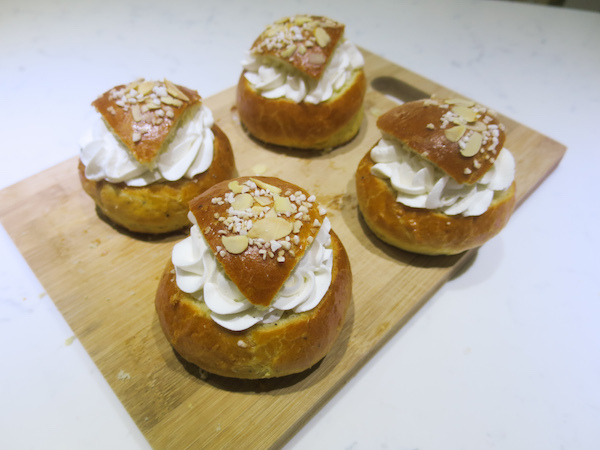 It’s my newest take on a Shrove Bun – laskiaispulla, with brioche dough that has high egg and butter content which gives it rich texture and tender crumb. And when it comes to the filling and topping, this one has a mix of it all – almond paste (in my case it was sugar free marzipan), jam and lots of whipped cream and topped with sliced almonds and pearl sugar! 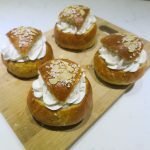 Laskiaispulla is one of the seasonal Finnish pastries I love the most and it’s always best homemade! One of the first recipes I shared on the blog was my heart shaped shrove buns knead by hand and two years ago I made a faster version using dry active yeast , I’ve linked them both for more options, though please note that the older one is from before I started using recipe plugin and therefore the printing options are different. 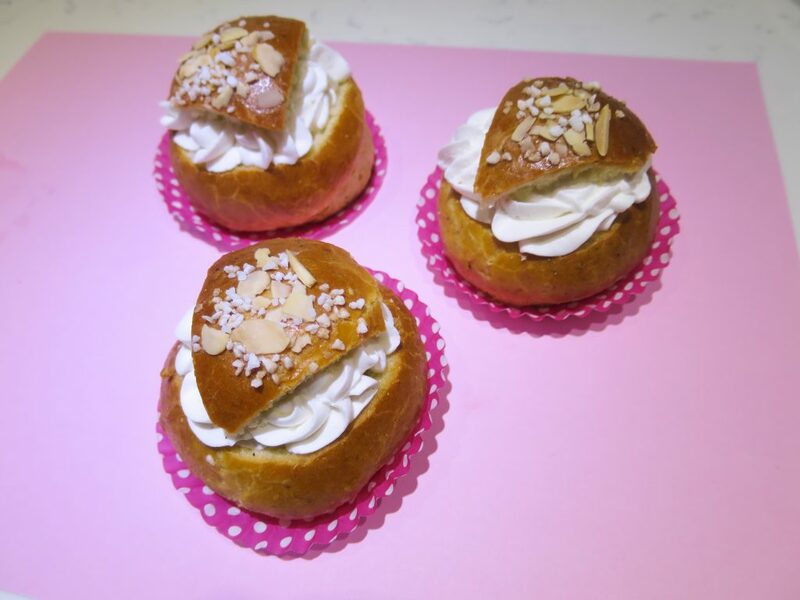 Whether you celebrate Shrove Tuesday with pancakes or sweet-buns, may it be a happy and super tasty one! In a mixing bowl combine flour, sugar, yeast, cardamon and eggs and mix with a dough hook on low speed. Then add salt and increase speed to medium. Cut the butter into cubes and gradually add to the mixer increasing the speed to maximum and continuing to mix until incorporated and falls off the dough hook. Turn onto a lightly floured baking sheet, sprinkle flour on top then cover and place in refrigerator for at least 6 hours. Line a baking sheet with parchment paper and lightly flour countertop. Turn the refrigerated dough on the floured surface, divide into 4 sections and roll the sections into ball shaped and place on the prepared baking sheet. 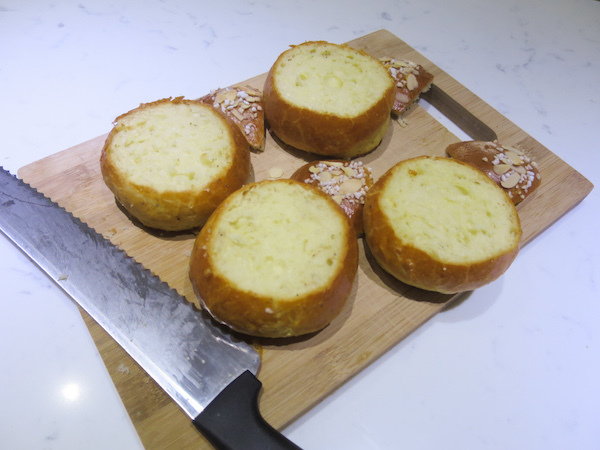 Mix the egg wash in a glass, brush over the risen buns and sprinkle almond flakes and pearl sugar on top. Allow to cool a bit then cut a slice from the top and shape it as you like, for topping on the filling. In a mixing bowl whip the cream with powdered sugar and vanilla bean paste. Place in a piping bag with a large star piping tip. 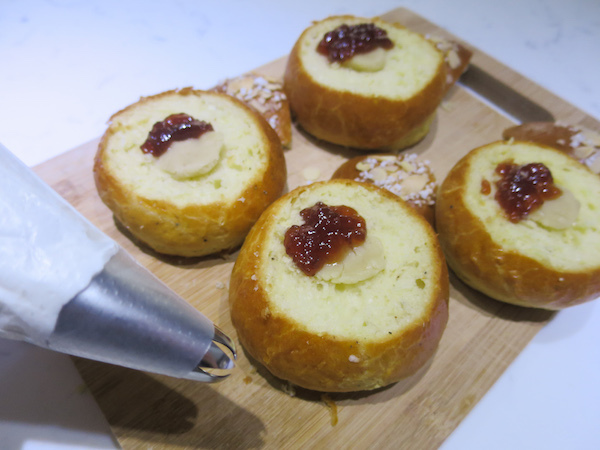 Place a spoonful of jam and or almond paste on the cut bun then pipe generous amount of whipped cream on top and top it with the cut top slice of the bun.